"Master Sun's Rules of Warfare"
The Art of War is an ancient Chinese military treatise dating from the 5th century BC. Attributed to the ancient Chinese military strategist Sun Tzu ("Master Sun", also spelled Sunzi) the text is composed of 13 chapters, each of which is devoted to one aspect of warfare. It is commonly thought of as a definitive work on military strategy and tactics. 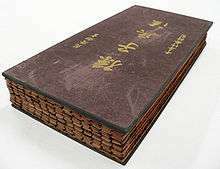 It was placed at the head of China's Seven Military Classics upon the collection's creation in 1080 by Emperor Shenzong of Song, and has long been the most influential strategy text in East Asia. It has had an influence on Eastern and Western military thinking, business tactics, legal strategy and beyond. The book was first translated into French in 1772 by the Jesuit Jean Joseph Marie Amiot and a partial translation into English was attempted by British officer Everard Ferguson Calthrop in 1905. The first annotated English translation was completed and published by Lionel Giles in 1910. Leaders such as Mao Zedong, General Vo Nguyen Giap, General Douglas MacArthur and leaders of Imperial Japan have drawn inspiration from the work. Sima Qian's 1st century BC work Records of the Grand Historian (Shiji), the first of China's 24 dynastic histories, records an early Chinese tradition stating that a text on military matters was written by one Sun Wu—usually known as "Master Sun" (Sunzi or Sun-tzu)—from the State of Qi, and that this text had been read and studied by King Helu of Wu (r. 514–495 BC). This text was traditionally identified with the received Master Sun's Art of War. The conventional view, which is still widely held in China, was that Sun Wu was a military theorist from the end of the Spring and Autumn period (776–471 BC) who fled his home state of Qi to the southeastern kingdom of Wu, where he is said to have impressed the king with his ability to train even dainty palace ladies in warfare and to have made Wu's armies powerful enough to challenge their western rivals in the state of Chu. Beginning around the 12th century, some scholars began to doubt the historical existence of Sunzi, primarily on the grounds that he is not mentioned in the historical classic The Commentary of Zuo (Zuo zhuan 左傳), which mentions most of the notable figures from the Spring and Autumn period. The name "Sun Wu" (孫武) does not appear in any text prior to the Records of the Grand Historian, and has been suspected to be a made-up descriptive cognomen meaning "the fugitive warrior": the surname "Sun" is glossed as the related term "fugitive" (xùn 遜), while "Wu" is the ancient Chinese virtue of "martial, valiant" (wǔ 武), which corresponds to Sunzi's role as the hero's doppelgänger in the story of Wu Zixu. Unlike Sun Wu, Sun Bin appears to have been an actual person who was a genuine authority on military matters, and may have been the inspiration for the creation of the historical figure "Sunzi" through a form of euhemerism. In 1972, the Yinqueshan Han slips were discovered in two Han dynasty (206 BC – AD 220) tombs near the city of Linyi in Shandong Province. Among the many bamboo slip writings contained in the tombs—which were sealed around 134 and 118 BC, respectively—were two separate texts: one attributed to "Sunzi", corresponding to the received text, and another attributed to Sun Bin, which explains and expands upon the earlier The Art of War by Sunzi. The Sun Bin text's material overlaps with much of the "Sunzi" text, and the two may be "a single, continuously developing intellectual tradition united under the Sun name". This discovery showed that much of the historical confusion was due to the fact that there were two texts that could have been referred to as "Master Sun's Art of War", not one. The content of the earlier text is about one-third of the chapters of the modern The Art of War, and their text matches very closely. It is now generally accepted that the earlier The Art of War was completed sometime between 500 and 450 BC. Forces (Chinese: 兵勢，兵势) explains the use of creativity and timing in building an army's momentum. Weaknesses and Strengths (Chinese: 虛實，虚实) explains how an army's opportunities come from the openings in the environment caused by the relative weakness of the enemy and how to respond to changes in the fluid battlefield over a given area. Variations and Adaptability (Chinese: 九變，九变) focuses on the need for flexibility in an army's responses. It explains how to respond to shifting circumstances successfully. In many East Asian countries, The Art of War was part of the syllabus for potential candidates of military service examinations. Various translations are available. During the Sengoku era in Japan, a daimyo named Takeda Shingen (1521–1573) is said to have become almost invincible in all battles without relying on guns, because he studied The Art of War. The book even gave him the inspiration for his famous battle standard "Fūrinkazan" (Wind, Forest, Fire and Mountain), meaning fast as the wind, silent as a forest, ferocious as fire and immovable as a mountain. During the Vietnam War, some Vietcong officers studied The Art of War and reportedly could recite entire passages from memory. General Vo Nguyen Giap successfully implemented tactics described in The Art of War during the Battle of Dien Bien Phu ending major French involvement in Indochina and leading to the accords which partitioned Vietnam into North and South. General Vo, later the main PVA military commander in the Vietnam War, was an avid student and practitioner of Sun Tzu’s ideas. America's defeat there, more than any other event, brought Sun Tzu to the attention of leaders of American military theory. The Art of War is listed on the Marine Corps Professional Reading Program (formerly known as the Commandant's Reading List). It is recommended reading for all United States Military Intelligence personnel and is required reading for all CIA officers. There are business books applying its lessons to office politics and corporate strategy. Many Japanese companies make the book required reading for their key executives. The book is also popular among Western business management, who have turned to it for inspiration and advice on how to succeed in competitive business situations. It has also been applied to the field of education. The Art of War has been the subject of law books and legal articles on the trial process, including negotiation tactics and trial strategy. The Art of War has also been applied in the world of sports. NFL coach Bill Belichick is known to have read the book and used its lessons to gain insights in preparing for games. Australian cricket as well as Brazilian association football coaches Luiz Felipe Scolari and Carlos Alberto Parreira are known to have embraced the text. Scolari made the Brazilian World Cup squad of 2002 study the ancient work during their successful campaign. The Art of War is often quoted while developing tactics and/or strategy in Electronic Sports. Particularly, one of the fundamental books about e-sports, "Play To Win" by MIT graduate David Sirlin, is actually just an analysis about possible applications of the ideas from The Art of War in modern Electronic Sports. The Art of War was released in 2014 as an ebook companion alongside the Art of War DLC for Europa Universalis IV, a PC strategy game by Paradox Development Studios, with a forward by Thomas Johansson. Sun Tzu on the Art of War. Lionel Giles, trans. London: Luzac and Company. 1910. The Art of War. Samuel B. Griffith, trans. Oxford: Oxford University Press. 1963. ISBN 0-19-501476-6. Part of the UNESCO Collection of Representative Works. Sun Tzu, The Art of War. Thomas Cleary, trans. Boston-Shaftsbury: Shambhala. 1987. The Art of Warfare. Roger Ames, trans. Random House. 1993. ISBN 0-345-36239-X. . The Art of War. John Minford, trans. New York: Viking. 2002. ISBN 0-670-03156-9. The Art of War: Sunzi's Military Methods. Victor H. Mair, trans. New York: Columbia University Press. 2007. ISBN 978-0-231-13382-1. The first Manchu translations of Chinese works were the Liu-t'ao 六韜, Su-shu 素書, and San-lueh 三略- all Chinese military texts dedicated to the arts of war due to the Manchu interests in the topic, like Sun-Tzu's work [he Art of War. The military related texts which were translated into Manchu from Chinese were translated by Dahai. Manchu translations of Chinese texts included the Ming penal code and military texts were performed by Dahai. These translations were requested of Dahai by Nurhaci. The military text Wu-tzu was translated into Manchu along with Sun-Tzu's work The Art of War. Chinese history, Chinese law, and Chinese military theory classical texts were translated into Manchu during the rule of Hong Taiji in Mukden with Manchus placing significance upon military and governance related Chinese texts. A Manchu translation was made of the military themed Chinese novel Romance of the Three Kingdoms. Chinese literature, military theory and legal texts were translated into Manchu by Dahai and Erdeni. The translations were ordered in 1629. The translation of the military texts San-lüeh, Su-shu, and the Ta Ming hui-tien (the Ming law) done by Dahai was ordered by Nurhaci. 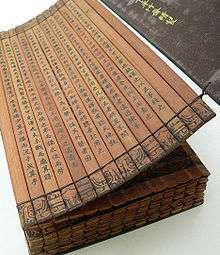 While it was mainly administrative and ethical guidance which made up most of San-lüeh and Su Shu, military science was indeed found in the Liu-t'ao and Chinese military manuals were eagerly translated by the Manchus and the Manchus were also attracted to the military content in Romance of the Three Kingdoms which is why it was translated. 1 2 3 4 5 6 Gawlikowski & Loewe (1993), p. 447. ↑ Mair (2007), pp. 12-13. 1 2 Mair (2007), p. 10. 1 2 Gawlikowski & Loewe (1993), p. 448. 1 2 3 Gawlikowski & Loewe (1993), p. 449. ↑ Mark Edward Lewis (2005), quoted in Mair (2007), p. 18. 1 2 Griffith, Samuel B. The Illustrated Art of War. 2005. Oxford University Press. p. 17, 141-143. 1 2 McCready, Douglas. Learning from Sun Tzu, Military Review, May–June 2003. ↑ Army, U. S. (1985). Military History and Professional Development. U. S. Army Command and General Staff College, Fort Leavenworth, Kansas: Combat Studies Institute. 85-CSI-21 85. ↑ Jeffrey, D (2010). "A Teacher Diary Study to Apply Ancient Art of War Strategies to Professional Development". The International Journal of Learning. 7 (3): 21–36. ↑ Solomon, Samuel H., "The Art of War: Pursuing Electronic Evidence as Your Corporate Opportunity"
↑ "Put crafty Belichick's patriot games down to the fine art of war". The Sydney Morning Herald. 2005-02-04. ↑ Winter, Henry (June 29, 2006). "Mind games reach new high as Scolari studies art of war". Irish Independent. 1 2 Shou-p'ing Wu Ko (1855). Translation (by A. Wylie) of the Ts'ing wan k'e mung, a Chinese grammar of the Manchu Tartar language (by Woo Kĭh Show-ping, revised and ed. by Ching Ming-yuen Pei-ho) with intr. notes on Manchu literature. p. 39. ↑ Royal Asiatic Society of Great Britain and Ireland. North China Branch, Shanghai (1890). Journal of the North China Branch of the Royal Asiatic Society. Kelly & Walsh. pp. 40–. ↑ Early China. Society for the Study of Early China. 1975. p. 53. ↑ DURRANT, STEPHEN. 1977. “MANCHU TRANSLATIONS OF CHOU DYNASTY TEXTS”. Early China 3. [Cambridge University Press, Society for the Study of Early China]: 52–54. http://www.jstor.org/stable/23351361. ↑ DURRANT, STEPHEN. 1977. “MANCHU TRANSLATIONS OF CHOU DYNASTY TEXTS”. Early China 3. [Cambridge University Press, Society for the Study of Early China]: 53. http://www.jstor.org/stable/23351361?seq=2. ↑ Sin-wai Chan (2009). A Chronology of Translation in China and the West: From the Legendary Period to 2004. Chinese University Press. pp. 60–61. ISBN 978-962-996-355-2. ↑ Peter C Perdue (30 June 2009). China Marches West: The Qing Conquest of Central Eurasia. Harvard University Press. pp. 122–. ISBN 978-0-674-04202-5. ↑ FREDERIC WAKEMAN JR. (1985). The Great Enterprise: The Manchu Reconstruction of Imperial Order in Seventeenth-century China. University of California Press. pp. 44–. ISBN 978-0-520-04804-1. ↑ Early China. Society for the Study of Early China. 1977. p. 53. ↑ Claudine Salmon (13 November 2013). Literary Migrations: Traditional Chinese Fiction in Asia (17th-20th Centuries). Institute of Southeast Asian Studies. pp. 94–. ISBN 978-981-4414-32-6. ↑ Cultural Hybridity in Manchu Bannermen Tales (zidishu). ProQuest. 2007. pp. 25–. ISBN 978-0-549-44084-0. ↑ West, Andrew. "The Textual History of Sanguo Yanyi: The Manchu Translation". Retrieved 11 October 2016. ↑ Arthur W. Hummel (1991). Eminent Chinese of the Ch'ing period: 1644-1912. SMC publ. p. vi. ISBN 978-957-638-066-2. ↑ Translation of the Ts'ing wan k'e mung, a Chinese Grammar of the Manchu Tartar Language; with introductory notes on Manchu Literature: (translated by A. Wylie.). Mission Press. 1855. pp. xxxvi–. ↑ Durrant, Stephen. 1979. “Sino-manchu Translations at the Mukden Court”. Journal of the American Oriental Society 99 (4). American Oriental Society: 653–61. doi:10.2307/601450. http://www.jstor.org/stable/601450?seq=2 pp. 654-656. Graff, David A. (2002). Medieval Chinese Warfare, 300-900. Warfare and History. London: Routledge. ISBN 0415239559.